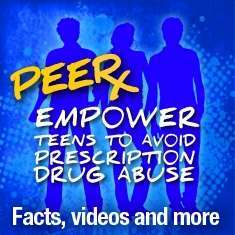 PEERx is a free, online initiative designed to educate teens in grades 8-10 on the dangers of prescription drug abuse. The centerpiece of this initiative is "Choose Your Path," an interactive video that allows the viewer to assume the role of the main character to "call the shots"in the story and watch the drama unfold. Other features of PEERx include an Activity Guide with step-by-step instructions for teens, fact sheets, colorful downloads that can be made into iron-on t-shirt decals, stickers, posters, and wallpapers. Visit the NIDA Teen Web site to learn more.